Sunny Meade provides an exclusive, unique, warm and elegant wedding facility to compliment the most important event of your life. Located in Scott, Louisiana, we provide end-to-end services for weddings, receptions, or any other special occasions including the convenience of planning and coordination (so you don’t have to worry about anything), catering, honeymoon suite, music, the ability to have indoor or outdoor ceremony, convenient location… all wrapped in a charming, spacious and picturesque atmosphere which the most special event of your life should deserve. 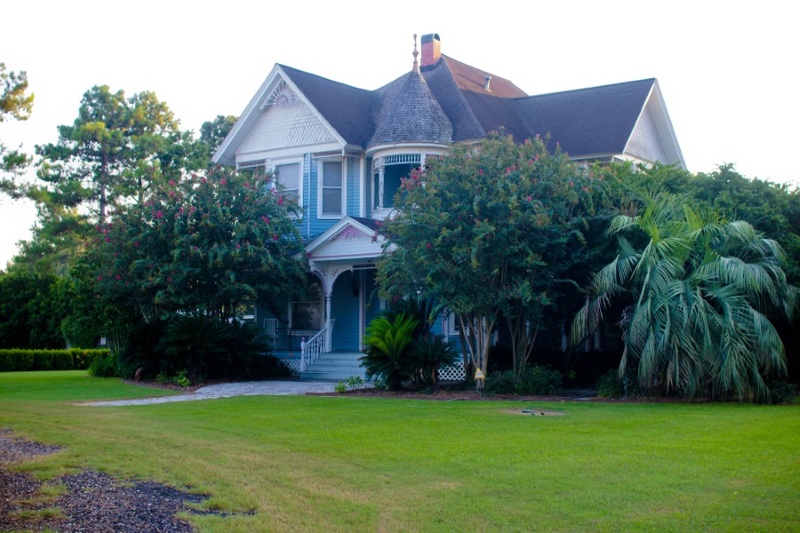 Built by the Humphrey family in 1899, it has been the home of Sunny-Meade since the late 1980’s. Sunny-Meade was originally structured in Jennings, Louisiana. Mrs. Humphrey named her beautiful home after a voluptuous meadow of yellow flowers that sat across the street. Today Sunny-Meade is owned by Charlie and Barbara Primeaux who moved the home to Scott and with care they completely refurbished Sunny-Meade to its original elegance. Gardens, Gazebo & Atrium to Say I do and Celebrate In! Sunny-Meade is known for its beautiful courtyard, glassed in atrium and gazebo in a Victorian ambience. Sunny-Meade’s courtyard is the perfect setting for your wedding and reception. The facility is for couples seeking “historic elegance” in a Queen Ann setting. All-Inclusive Wedding Services to Exceed Your Expectations! Sunny Meade caters to a variety of tastes. We can modify our menus to your preference, ensuring that you and your guests will love and remember our Southern hospitality and cuisine. All of our catering contracts will include food, glassware, silver serving utensils and all required event staff. All beverage services (including non-alcoholic and alcoholic packages) will be provided through Sunny-Meade. We offer a variety of open bar and cash bar packages. All beverages, staff, and glassware will be provided through our beverage contract. • Will I need to hire a Wedding Planner? No, Sunny-Meade has a Wedding Planner on staff to help with coordinating. • Does Sunny-Meade do its own catering? Yes, there are four menus to choose from, and they range in price. • Do I have to worry about setting up a bar? No, Sunny-Meade has several bar packages that include the total set up, such as bartenders, champagne for toasting and champagne for the Honeymoon suite. • Is the Honeymoon Suite included? Yes, the Honeymoon couple will have full access to the home, pool and Jacuzzi. • How many guests can Sunny-Meade accommodate? Sunny-Meade has a minimum of 100 and a maximum of 300 people. • How do I go about decorating? Sunny-Meade has a package that includes centerpieces, garland and gazebo for the ceremony, linens on cake tables, floral arrangements, etc. A complimentary southern breakfast is served at 7:00-9:00 the next morning. • How do I reserve my date at Sunny-Meade? Whenever a date is decided, a deposit is required to reserve your date. • How far in advance should I reserve my date? Usually, if a specific date is desired, Sunny-Meade suggests one year in advance. However, that doesn't mean that your date is booked. It is always a good idea to call and check, no matter how late it may seem. • How do you handle rainy weather? Sunny-Meade does have a back up plan. In the case of inclement weather, the ceremony is moved in the atrium. • Who is allowed in the actual home during the reception? Only immediate family and anyone in group pictures are allowed in the house. • Is there a place for the Bride to get dressed? Yes. There is a Bridal Suite for the Bride to use in the house. • Is there an onsite DJ? Sunny-Meade does have an onsite DJ, but you are more than welcome to bring in your own DJ or band. • Would I be able to take pictures at Sunny-Meade? Of course. If your ceremony and/or reception is planned at Sunny-Meade, you are more than welcome to come and take engagement pictures and bridal portraits at Sunny-Meade. • What are some of the items that I would be responsible for bringing into Sunny-Meade? Photographer, cakes, videographer, personal items (sign-in book, pen, toasting glasses, etc. ), officiant for the ceremony, your attire (tuxedo, wedding dress, etc.) and florist (for bouquets, boutonnieres and corsages). We take care of the rest!